The Best Books Ever: HAPPY BIRTHDAY SARAH! You are a fantastic person, friend, and blogging buddy! I am so lucky that I know you! I know we don't see each other face to face anymore (being like 6 states away from each other does that I suppose), but I still thank God every day I met you! Aren't we cute? This was pre-digital cameras people! Sarah and my now hubby Jim! Sarah and I met our freshman year in Penn State. We have known each other for 11 years- holy cow! She was all cool hanging out with the sophomores while I knew noone. 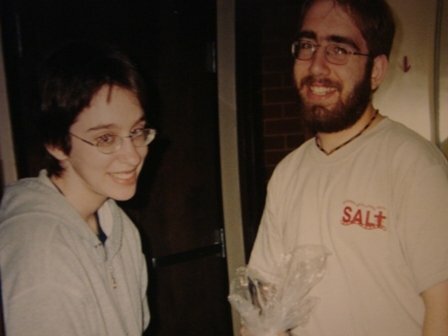 We met at a student organization and I think it was love at first anime ;) We lived together (and survived!). Sarah has seen me at my best and my worst. And somehow we are still friends.... I think that says the most! Happy Birthday! :D Have a great day. According to FTC guidelines, The Best Books Ever is required to note all books that are given to our site in exchange for a review. Book reviews note whether or not a book was received for free. Receipt of a book from a publisher, author, or other entity is not a guarantee of a positive review, or of a review at all. The manner in which we receive books does not influence the content of our reviews.